Today, I spent the better part of the afternoon tossing a pair of nymphs to eager fish that seemed to know winter is on its way. As I worked downstream and fought off the cold and the gusting wind, I found myself thinking of another day on another river. I was fishing with Shawn Brillon, Bob Mead, and Paul Ptalis. We were jaw-jacking and laughing more than fishing, a wonderful day in all the ways that matter. Foremost in my memory is a respectable brown that Paul took on a greased Hornberg. I suppose you had to be there, but watching that fish fall all over itself while trying to engulf Paul’s skating streamer … well … it was absolutely hysterical. The day stands out in my memory as it was the last time the four of us fished together. Paul passed away last November, after losing a prolonged battle with cancer. He was a talented fisherman, a transcendent tyer of Atlantic salmon flies, a patient tutor, and a good man. Today, as autumn gave up its ghost, I couldn’t help but think of Paul and his fish. I suppose the day will come when my friends will reminisce about the time they spent on the water with me. If I’m very lucky, they’ll remember how much I appreciated the river and my time with them. I hope that memory makes them smile as much as I did today. Here, you’ll find a video of Paul releasing his Hornberg fish. Here, you'll find the American Cancer Society. 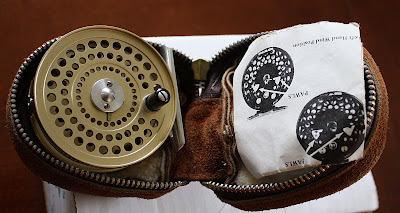 Alex Landeen over at Fat Guy Fly Fishing has written a short but poignant piece about those "close but no cigar" days. It's well worth the thirty seconds it will take to read.